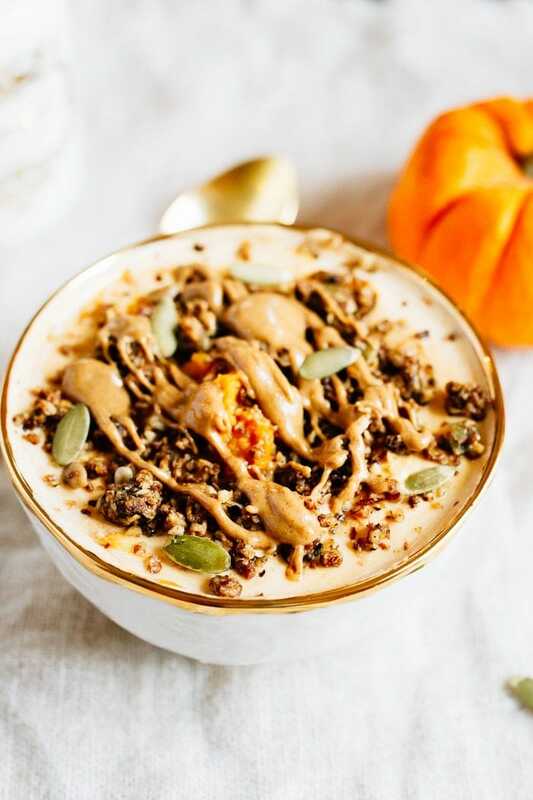 This protein packed pumpkin pie yogurt bowl is the perfect fall breakfast. Loaded with protein packed yogurt, pumpkin puree, pumpkin pie spice and all your favorite toppings! I’m always looking for easy protein-packed breakfast ideas. 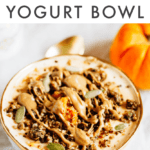 Currently I’m hooked on my hormone balancing breakfast, but recently I decided to bring an old favorite back — this pumpkin pie yogurt bowl. Pumpkin is my favorite fall flavor and during this time of the year I like to put it in everything — including yogurt. Many mainstream yogurt brands have a pumpkin pie flavor now, but it’s so easy to make it at home. 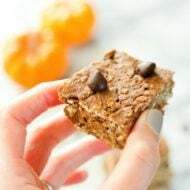 Especially when you have leftover pumpkin sitting around after baking something pumpkiny (like these pumpkin oatmeal chocolate chip cookies). You can use whatever type of yogurt you’d like and even make the recipe vegan by using coconut milk or almond milk yogurt. Neutral flavors like plain and vanilla will work best and if you’re trying to amp up your protein skyr or Greek yogurt will give you the most per serving. 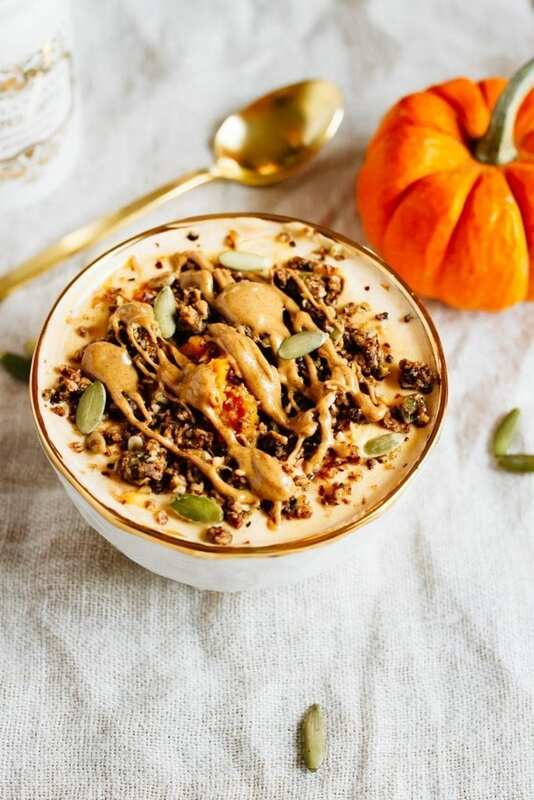 Since a true pumpkin pie yogurt bowl isn’t complete without toppings, I added an extra scoop of pumpkin puree, pumpkin spice pepitas, grain-free granola and a drizzle of almond butter. Each bite is filled with thick, creamy yogurt and a bit of crunch. Most importantly, this meal keeps me full all morning! 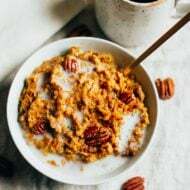 I’ve found the key to keeping myself from being ravenous between meals is to make sure I have a combination of protein, carbs, healthy fat and fiber — this breakfast did the trick! Aren’t recipes with one step the best? I think so, especially when it comes to breakfast and I’m running around the house like a mad woman trying to make it to the gym, shower, eat and look presentable for work. 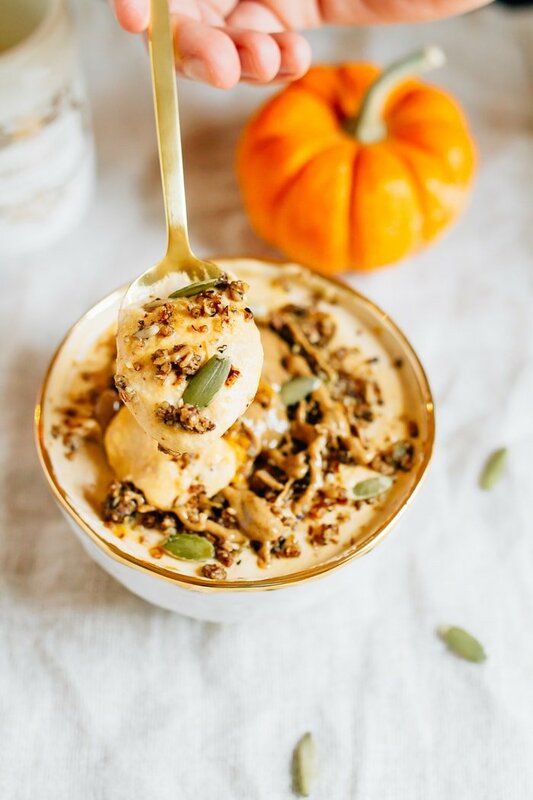 If you make this protein packed pumpkin pie yogurt bowl be sure to leave a comment and star rating below letting us know how it turned out. Your feedback is so helpful for the EBF team and our readers! Put all ingredients in a bowl and stir until everything is mixed together well. Top with toppings of your choice and enjoy! *The nutrition stats for this recipe will vary based on what type of yogurt you use. What an awesome idea! I love the fact that you used chias to thicken it up…yum! I love the idea of adding chai seeds. I too love chobani and I have mixed in pumpkin with the plain too and I topped mine with Kashi Go Lean. Delicious! YUM, sounds amazing! I love greek yogurt but I never even thought to make a twist on it with pumpkin. Thanks for the idea. Yummm. What a great and delish idea. Thanks for sharing. Mmm. Thanks for the recipe! There’s always room for more protein. I totally agree. Simple recipes are the best. And its never hurts to write them down. I love pumpkin in pretty much everything. I add it to my oats frequently in the fall. I have never tried adding it to yogurt. And happy birthday to Chobani. Maybe they will give me a birthday present and start carrying the strawberry banana flavor in my local grocery stores. This looks fantastic! I’m still waiting for Chobani to come out with a pumpkin flavor though. 🙂 Until then, this is a great alternative. I make something similar to this and love it! So tasty and filling. Mmm. I might have to make this as an afternoon snack for tomorrow afternoon. Looks great! Thanks for the recipe. Looks good! For me it’s all about the topping! YUM. Making this in the morning but using leftover roasted and pureed butternut squash. Thanks for making our breakfasts a little nicer this autumn! I love overnight oats. My tried and true mixins ins are Almond Milk, Oikos, Chia, Flax. Then I drizzle maple almond butter on top and sprinkle a few warmed berries. This is a great snack idea! I love that you included pumpkin and pumpkin pie spice. It is the season of pumpkins and they are so healthy too! I’m looking forward to trying the recipe. I love overnight oats, I’m feeling pretty ill at the moment and it’s the meal that appeals the most right now! So every morning before heading into school (I am a teacher), I spend some time on the internet while eating my breakfast. My week has been a bit crazy, so I needed to catch up on your blog. When I saw this recipe it made my morning! I was looking for a change in my morning snack. After realizing I had all the ingredients I grabbed my pyrex and started mixing! It smelled awesome and couldn’t wait to try it on my prep this morning. It was awesome! I added Bear Naked Oats and Honey with Flax Granola (I took out the blueberries and added raisins) and since I didn’t have chia I added ground flax. Thank you so much for a change in my morning snack! I can’t wait to have another batch! Hi Colleen, that’s definitely not a silly questions. Once you open the can of pumpkin just put the remaining amount in a container in the fridge. It should last about 1-2 weeks so no worries about wasting it! Actually, it wii keep much longer if you freeze it! I use my ice cream scoop and level it with a knife. It’s exactly 1/2 cup. Scoop pumpkin onto a pan, lined with wax paper. The next day, put the frozen pucks into a zip-lock freezer bag and you have 1/2 cup, premeasured puree that’s ready to go! Simply thaw at room temperature or microwave for about 30 seconds when you need it. If I were to use Agave nectar as a sweetener, how much would I use? I have a bottle I’ve never opened because I don’t know how much to use. Just looking for a guideline, really. I’ve often drizzled honey on my overnight oats, etc… but I wouldn’t mind trying the agave. Thanks for the recipe. It looks amazing! Hi Jen, I think agave’s sweetness is similar to that of honey. I would probably use about 1 teaspoon and see if it’s sweet enough for my tastes. Let me know what you think. I just found your blog and am drooling over all the healthy information and recipes you have! Thank you so much for taking the time to share! Yum… Can’t wait to try. I recently found pumpkin spice yogurt at one of my local grocery stores, but of course, it’s onlt seasonal and they are out already… so can’t wait to try this. One question though is the canned pumpkin the same canned pumpkin you use for pumpkin pies, cause I know I have seen receipes where they call for canned pumpkin but state specifically not the pumpkin used for pumpkin pies? Yum! You have so many good ideas. 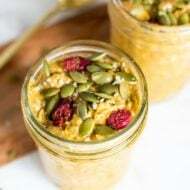 I make so many of your recipes 🙂 Addicted to the Tempeh Butternut Bake, and looks like I am trying this yogurt this weekend with some leftover pumpkin! Thank you, as always!! 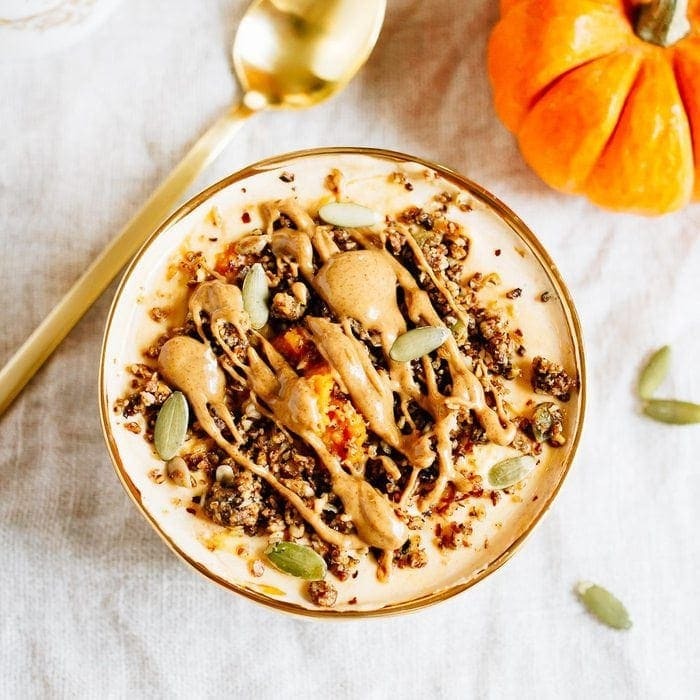 I love pumpkin yogurt, and your proportions of everything plus those toppings look amazing! I went to a Siggis event today and they gave away free samples of their pumpkin spice yogurt…I can’t wait to try. You lucky duck. I’ve been looking for it in stores this year. I am adoring(!!) the bowl and gold spoon. Yay for pumpkin season. Totally delicious! Thanks for sharing. This looks amazing- I’ll have to try it! Also: I love your spoon! I’m all out of Yogurt – I’m heading to the store in a bit to pick me up some so I can try this – it sounds delicious! I’ve never seen pumpkin spice yogurt here in Canada (you guys get such a better selection of products in the US!) so I’ve always loved making my own pumpkin yogurt. The toppings on this look fabulous! Would love to start my day with this! Love the pumpkin pie flavor! What are your thoughts on fat free yogurt?